To view our current inventory of similar binnacles and compasses, click here! Modified to preserve the top section only, this presentation binnacle makes a dramatic statement of importance. It is a perfect gift or as a focal point in any decor. Presented is a fine E.S. Ritchie, Boston, binnacle in excellent condition considering its age and use at sea. 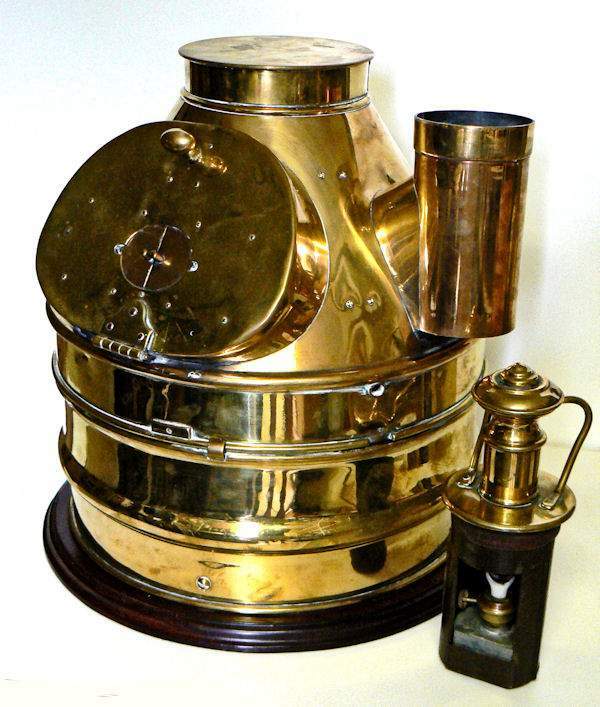 It is of a massive design that was used at the turn of the 20th Century on the largest size ships. 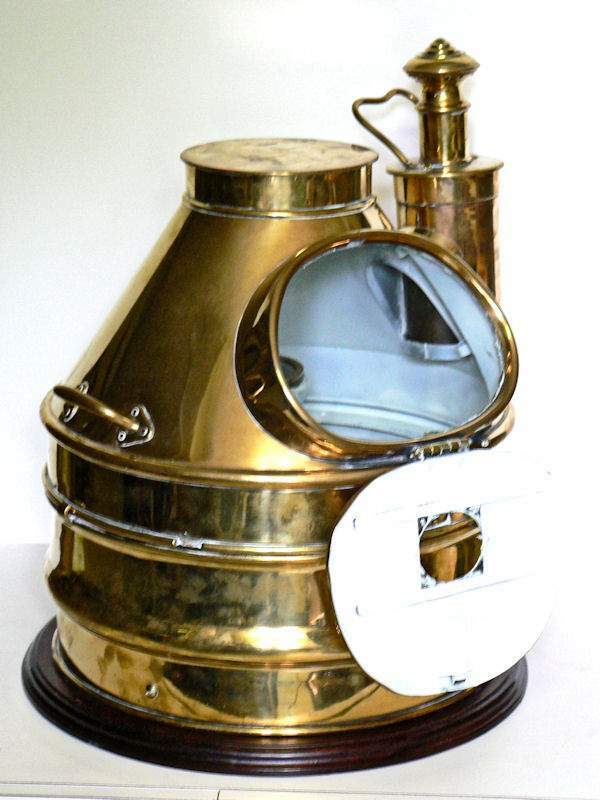 The brass hood has a large hinged oval viewing port in front that is flanked by a kerosene burner. The appearance is very striking compared to the binnacles which are most prevalent today. The burner is original and functional. THE COMPASS: The fully gimbaled antique compass is of a Turn of the Century design. It measures 10 1/2" in diameter and is fitted with a 8 1/4" card being the largest of this style that we have seen. Stamped on the bezel is Serial Number 38519 and Richie, Boston. The solution is clear and without bubbles. The subdivisions are in Cardinal Points, N.S,E,W, and quarter points, NE,SE,SW,NW, then 1/2 points, 1/8 points and finally 1/16 points. There are 32 points on the compass card, each being 11 1/4 degrees. The outer circle is graduated in degrees from 0 to 359 with the north pointer as an ornate Fleur des Lis with the maker's name and Boston. 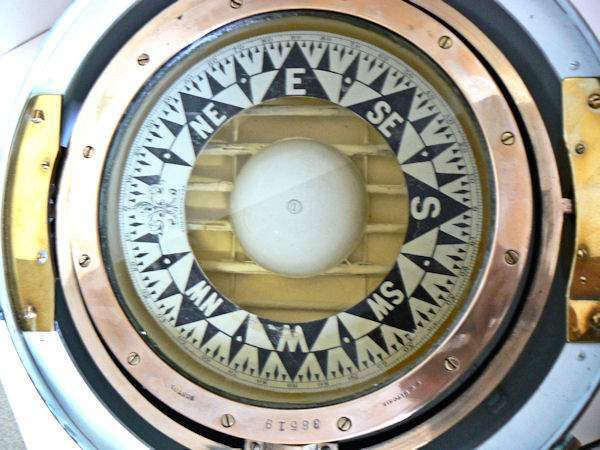 In 1850 physicist Edward S. Ritchie began developing the first U.S. manufactured marine compass. He had received a contract to repair foreign-made compasses from the Boston Naval Shipyard, and he soon realized most of the problems he encountered could be eliminated. So when the US Naval Observatory put out a call for American Manufactured navigational instruments in 1861 it was no surprise who they contacted first. Ritchie completed and sent samples of his work (including the first ever liquid filled compass) in June of 1861 and by August he received an order from the US Navy for 26 compasses, 10 of which were liquid filled. At this time Ritchie began selling compasses under the name E.S. Ritchie & Co., which was later changed to E.S. Ritchie & Sons in 1867. To this day E.S. Ritchie & Sons continues to produce marine navigation instruments. A model of Ritchie’s first liquid filled compass is on display today in the Museum of Science in London, England; the only foreign product so honored. In 1951 the company was purchased by Marine Compass Company. Louis A. Sherman founded the Marine Compass Company in 1910 and concentrated on producing smaller instruments for commercial and fishing vessels as well as the emerging yachting markets. The two companies consolidated all operations under the name E.S. Ritchie and Sons and is still owned by the Sherman Family. This is a very special and a rare find. Recommended for that special person. It's mounting makes it ideal for display or as a presentation! SHIPPING & PACKING: The cost of shipping, packing, handling, and insurance to your destination, must be calculated. You may email us before bidding to get these costs. We price our shipping honestly, but we expect to be reimbursed for the nominal cost of packaging materials and handling. It will be slightly more to have it delivered by our antique courier. International buyers welcome. We have satisfied customers in Argentina, Australia, Austria, Belgium, Bermuda, British Virgin Islands, Canada, Chile, China, Czech Republic, Democratic Republic of Congo, Denmark, Estonia, England, France, Germany, Greece, Holland, Hong Kong, Hungary, Iceland, Ireland, Israel, Italy, Japan, Kuwait, Latvia, Luxembourg, Malaysia, Martinique, Mexico, New Zealand, Norway, Nova Scotia, Panama, Poland, Portugal, Puerto Rico, Romania, Saudi Arabia, Scotland, Singapore, Spain, Sweden, Switzerland, Thailand, Turkey, United Arab Emirates, USVI and the Eastern Caribbean.